Seems like there will be a huge amount of wasted funds, executing and scaling (or at least trying to) even before a repeatable, scalable and viable business model is found. Is it really sensible and possible for the Ubers and Katzenbergs to own the whole market if there is no viable business model there? Won’t they come crashing down eventually? It’s a bit strange to use Uber and Katzenberg (by which I assume NewTV) in the same sentence. Uber is definitely providing a service people want and other people are willing to provide. There’s a paper showing that Uber generates a huge consumer surplus — despite being operationally profitable. This is literally the opposite of a company that has a pretty bad idea, no execution, no market research, and a bunch of (presumably not very smart) money. Assuming NewTV is right, how does it beat Youtube? Thanks @podperson I hadn’t thought of Uber as operationally profitable as the venture spends billions to “own the entire market.” The billions, in my opinion, seem to obfuscate / hide the fact that their position is not that defensible, their business model not that different than taxis, and the future is not clear with regards to how things will work with self driving cars (e.g. who will own them). I don’t see it as a sure win, apart from the strong brand awareness. I don’t know enough about NewTV or what young people see in YouTube to suggest how it could beat YouTube. I know one of our sons consumes more YouTube than TV. In fact, more YouTube than pretty much anything except SnapChat. I’m not sure they are looking for high production value or higher quality content. I’m not even sure what high quality content would be like in that format (i.e. short form videos). I guess we will see soon enough. >I’m not sure they are looking for high production value or higher quality content. I’m not even sure what high quality content would be like in that format (i.e. short form videos). On the contrary, I think a big part of the appeal of YouTube in the first place is the lower production value of the videos on the platform. I think anyone who’s attempting to compete with YouTube by offering higher production value with their videos is completely missing the mark, imo. Hi Steve, you are referring to the less than 1% of enterprises (unicorns) in the above article and I still believe that for the 99% Lean Start-up is more relevant than ever. It has been very interesting to see how Lean has been implemented in various sectors and enterprise stages and types over the years. There is a rich base of knowledge emerging from its diverse application which is still very meaningful and helpful. I must, however, continue to ask why focus on the 1% when it is the 99% that fuel our economies and in increasing numbers are providing real solutions to systemic problems that we face? I think the title is clickbait and deceiving. As you said, the article is focused on the 1% unicorns but characterized in a way that makes it sound like it applies to all organizations, which it doesn’t. The title poses a question which the article answers. The article is about the capital markets and shifts in perceptions and sensibilities of VCs and some entrepreneurs. Like most Steve’s articles it either provides easy to miss insights or points to the changes in trends to those of us who are too busy running businesses to pay attention to the news or connect the dots (that would be me). I see it differently. If the title were “Is Lean Dead for Unicorns?” I’d skip the article because that’s lofty for the 99%ers. But, if unicorns can finance their way around the lean process to expose new markets, history suggests those new markets create huge opportunities for that 99% (a la Amazon, Etsy, AirBnB, Uber, YouTube, etc.). Too, the unicorn also has to educate consumers about that new market which traditionally takes years, but Blank is suggesting may be speeded up with funding. So the 99%ers would need to understand this paradigm if they want to be early adopters and secure a niche in the new market. Maybe the real difference here is that when the potential market is huge you can worry less about “fit”. Maybe lean has been going about things in reverse and the first step to find a realistic measure of market size for the product before iterating around a “fit”. Maybe the knob to adjust is market size rather than the knob being the entirety of the product. And maybe a variable in all of this is how much effort a potential customer would need to put into altering their behavior to use our product. 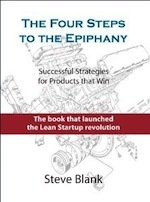 The Lean Startup is no more, or less “dead” than any other moment in time, which point you make very clear. The real question is how soon traditional banking and national currency systems will be “dead” by comparison. When all measure of capitalization is secured beyond institutional and national power systems—a trend well underway in what is essentially now all-out war between timeless civil- and faith-based power structures—the traditional currencies by which we “bankroll” what we deem as a good payoff or investment will be just another “virtual” alternative. The real wealth opportunity is in backing truly free capital flow among individual human beings—which of course is exactly what is being done in both NewTV capitalization via Katzenberg/Whitman reputation and Lean Startup entrepreneurship everywhere else in the world. It is a valuable clarification that being lean with respect to money my not be the smartest investment of your energies if money is available in abundance. However, I find that lean methodologies are most useful when they are applied to the resource of time. Dominant market positions are acquired in ever shorter periods of time and hence being very efficient with that resource is becoming ever more important imho. It doesn’t matter how much money you have the bank, if you waste valuable time executing against an unproven hypothesis, you may still loose against less well funded competitors who are more frugal with respect to time and get to product-market fit faster. if big cash is a faster lane to success than slow and rigorous customer development, why should the bottom 99% of cash starved founders not focus on raising more cash rather than on understanding customer problems? so would you advise cash starved entrepreneurs to work more on credibility than on customer development? 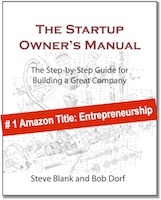 There is a typo in the fourth paragragp in the The Rise of the Lean Startup section. It’s Ries, Eric Ries, not Reis. thanks for the catch and apologies to Eric! 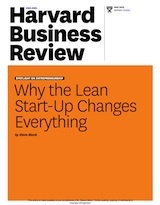 Of course, your analysis reinforces the importance of Lean Startup for the great majority of startups. But, being able to reflect and share an opposite argument regarding the work you’ve being doing for so many years is still admirable. Thanks. Advice often has a half-life. It’s good practice to often test if it’s still valid. And for Latin America, Africa, and other places where capital is scarse, Lean and bootstrapping is sometimes the only alternative. I wonder if we are in a period of irrational exuberance at the moment. We have too many unicorns that aren’t even at a TRL level of 9. We are back in the cash-slush cycle. The investors have turned the faucet back on in 2018. However, all this easy capital floating around won’t kill the lean startups. One bust and people will be talking about them again. Thanks for connecting the dots and summarizing shifts in the trends Steve. As I am not looking for capital and too busy getting stuff done your articles always provide me with a viewpoint one can only form by reading, analyzing, discussing and distilling, a lot. Thank you. Look forward to each and every one of your articles. This is an interesting perspective indeed. Good theories tend to strengthen with time. If the lean methodology is already coming to an end then it leads me to believe that it was never a strong theory to begin with. This leads to point two..
Good theories should also be able to predict the future. Does this mean that the lean methodology was a post rationalisation? I.e. a narrative we created to explain how successful startups were created? My initial instinct is that if a business like the one described in this post will succeed, that it would be a new category of business. Not really a “startup” but something else, as in my experience the lean methodology simply works. The question still remains though whether this category would ever work. There is massive risk in raising so much capital and generally speaking the first mover advantage in the “long run” (a few years) is over rated when a new entrant refines the initial idea and finds a better business model (such as Google Vs Yahoo).